Cross laminated timbers are being used in mass quantities for the tallest wood building so far: a 121-unit, 10-story apartment complex in London. Architects Waugh Thistleton, CLT engineers Ramboll and developer Regal Homes, says the most exciting aspect of the project is the sheer size of the structure and its completion without the use of thousands of cubic meters of concrete. To be covered with a brick facade, the project has seen more than 3,500 m3 of timber arriving at the construction site as work gets underway on a record-breaking cross-laminated timber (CLT) residential structure, which will become the tallest of its kind in the world. 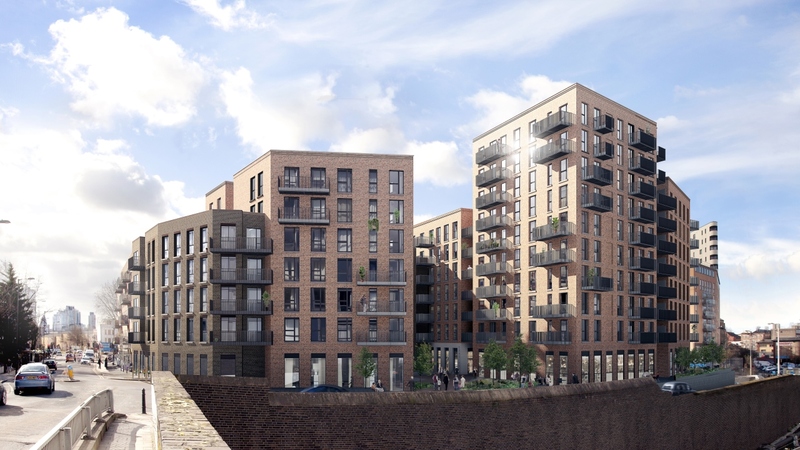 The 121-unit development is estimated to use more timber than any other project in the world, making it, by volume, the largest CLT project globally. 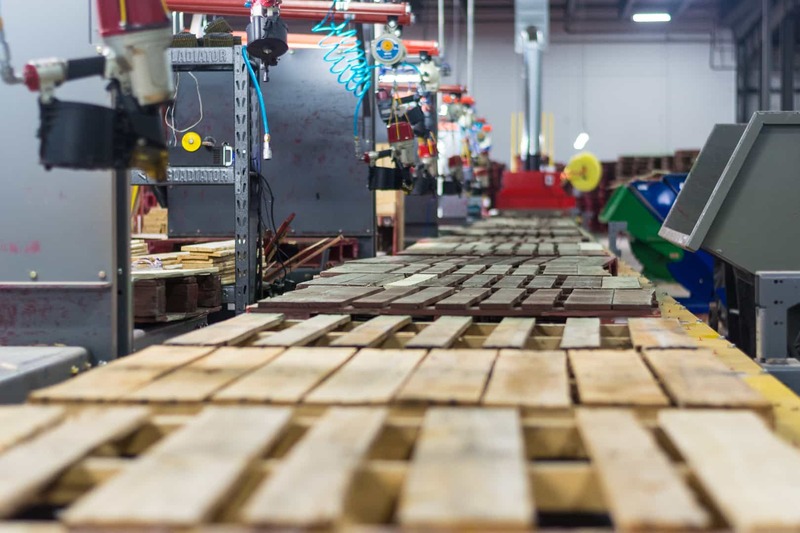 Sauter Timber's Production Facility in Rockwood, TN, built from CLT (cross laminated timber) and glulam. The project residential capacity of 121 units will be 12,500 sqm (about 125,000 square feet), with over 3,460 sqm of commercial space. CLT structures are the only sustainable solution to provide high quality, high density housing. Ramboll’s CLT experts have calculated that the building will save 2,400 tonnes of carbon, compared to an equivalent block with a concrete frame. 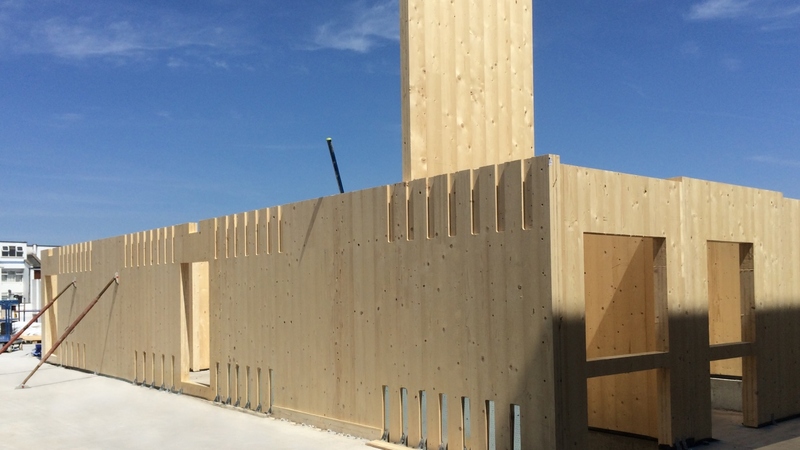 By using CLT construction, the embodied carbon is 2.5 times less than that of an equivalent concrete frame. 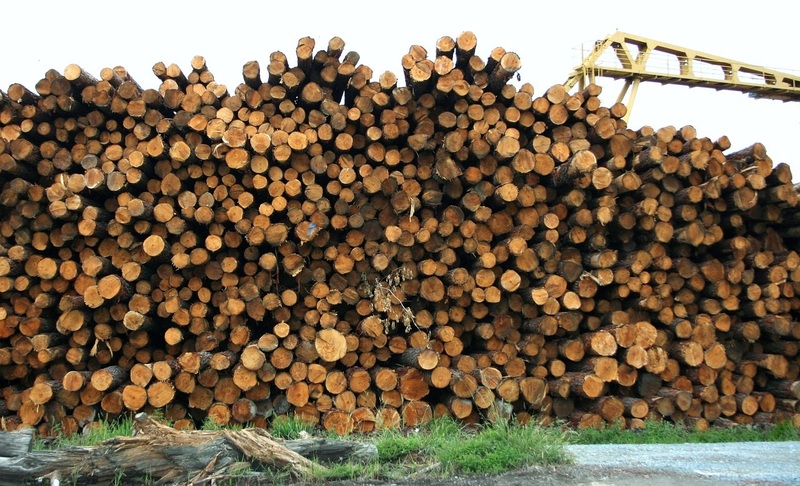 Taking into account that timber stores carbon by absorbing carbon dioxide (CO2) from the atmosphere, which is also known as ‘sequestered carbon,’ the structure can definitively be considered as ‘carbon negative’. Upholding its material integrity, Dalston Lane’s external, party and core walls, floors and stairs will be made entirely of CLT. 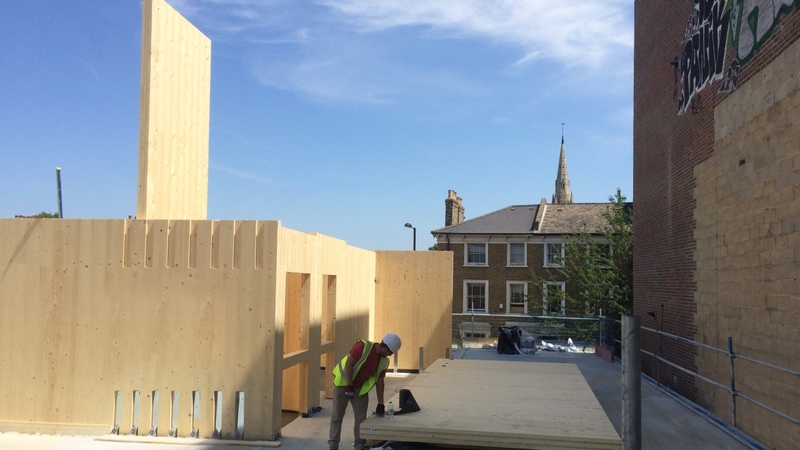 The London borough of Hackney actively encourages timber construction, mooting a ‘timber first’ policy in 2012, and this building will join a number of other timber buildings in the area making this central London borough a world leader for timber construction. I'm excited about all the enthusiasm for Cross Laminated Timber, but no one can tell me the trick. When I cross laminate timber the joints shear from cross grain swelling and shrinking. They will do this from atmospheric humidity changes, and one can only think that a plumbing accident would really tear the laminations apart. My efforts to learn how this new technology overcomes this problem have come to nothing. I've talked to one of the British architects and sent e-mail to the company in Austria, but gotten no response. Might you be able to feature some explanation of how the CLT producers are circumventing the swelling/shrinking problem? The key issue is, of course, to avoid heavy changes in humidity. That means keeping CLT dry during construction work and using CLT in appropriate places. In residental (and similar) buildings, no huge issues are reported. Some small, i.e. leaks beside the window due poor sealing work etc. However, these are easy to repair: just take out the damaged area and replace with new piece of CLT. No big deal for skilled carpenter. Nordic coniferous treespecies, like spruce, will not get wet very easily. Even in case of massive water flow, wood gets moist only couple of millimeters from surface. Greater damages require long-period of water contact. In that case, repair process is explained above. Hope this helped you. Feel free to ask more.